At least 1,130 deaths have been recorded following the collapse of Rana Plaza on 24 April 2013. The Plaza was home to several garment factories, among other shops and offices. It was located on the outskirts of the Bangladeshi capital Dhaka and provided garments for many western companies and brands including GAP, Walmart and United Colours of Benetton. Witness testimonies, corroborated by footage aired on BBC Newsnight, showed factory owner Sohel Rana declaring that the building’s cracks were only superficial plaster cracks. Union leaders confirmed that the workers were told to ignore cracks and return to work as normal. A recent fact-finding report by human rights group Odhikar states that Rana himself forced workers into the building when they expressed fear of entering. Aside from the death toll at the factory, the tragedy has resulted in a minimum of 3,000 children losing at least one parent, likely to be the mother, in an industry dominated by women. The owner, Rana, initially fled but was later arrested at the Indian border. He was a local leader of Jubo League, the youth wing of the ruling Awami League political party, and was supported by Awami League MP Murad Jong. Jong denied any association with Rana following the incident, although plenty of evidence exists of their partnership. In the western world fingers have been pointed at western companies who have been using garment factories. There has been comparatively little criticism towards the other responsible stakeholders including those in Bangladesh. However, we must go beyond this simplistic view and investigate due responsibilities. We live in a capitalistic world where instant gratification is the norm, perceived to be what we all should aspire to. It is a system that promotes fulfillment of desires and the acquisition of wealth, even at the cost of human lives, as long as the deaths do not take place on our own doorsteps. As such, we see hedonistic habituation, especially in relation to purchasing branded clothes. We are sold a lifestyle based on an economy that is dependent on continual growth, which can only happen if there is continual consumption. The anonymous street artist Banksy highlights this point brilliantly (see featured image). This piece of art is particularly poignant as the billboard is located in Tower Hamlets, less than one mile from Canary Wharf. This is a borough which has one of the highest GDP per capita by day, but one of the lowest by night. Of course the added irony is that Tower Hamlets is also home to the largest Bangladeshi community in the country. So responsibility lies on several fronts. On the Bangladesh side, there is a major problem that owners like Mr Rana are only concerned with generating money and little else. This means that working conditions faced by the workers are often inhumane and unsafe. This leads onto the macro level: Mr Rana was able to use his network in the ruling Awami League party to unlock doors and avoid laws. Much needs to be done at the state level in to ensure corruption is reduced, legislation is in place and enforced, and independent inspections take place at regular intervals. Considering the reaction of the Bangladeshi government, little is left to be said. Prime Minister Sheikh Hasina refused crisis aid and expertise from the international community, apparently to show the world that they had the matter under control. But we now know that the situation was so chaotic that volunteers were digging with their bare hands to rescue those beneath the rubble. On the western side, we have to acknowledge that western brands use Bangladeshi firms for cheap labour at the cost of ethical practice. Secondly, the lifestyle that is promoted in the western world is one of hedonistic consumption where people are mere pawns in a vicious economic cycle that allows the exploitation of lives in poorer countries. Nonetheless, I oppose those who advocate an end to buying Bangladesh-made garments. This will have detrimental consequences given that the garment industry in Bangladesh is worth $20bn – a major component in the national economy. If we all decide to stop purchasing Bangladesh-made products, this could potentially lead to unemployment and poverty. The solutions are not easy. We need to rethink our economic outlook on life. As consumers we have power to influence how products are made. Through raising awareness and education, I believe we can curb some of our materialistic habits. I recently had the pleasure of being introduced to the chief executive of an organisation called the New Economics Foundation (NEF). Their motto is “economics as if people and the planet mattered”. Research shows that we cannot sustain living the way we are without causing substantial damage to the planet and the environment, and happiness isn’t dependent merely on economic growth. Based on their research, NEF have developed The Happy Planet Index (HPI). This is a new measure of progress that focuses on what matters – the sustainable well-being of all. 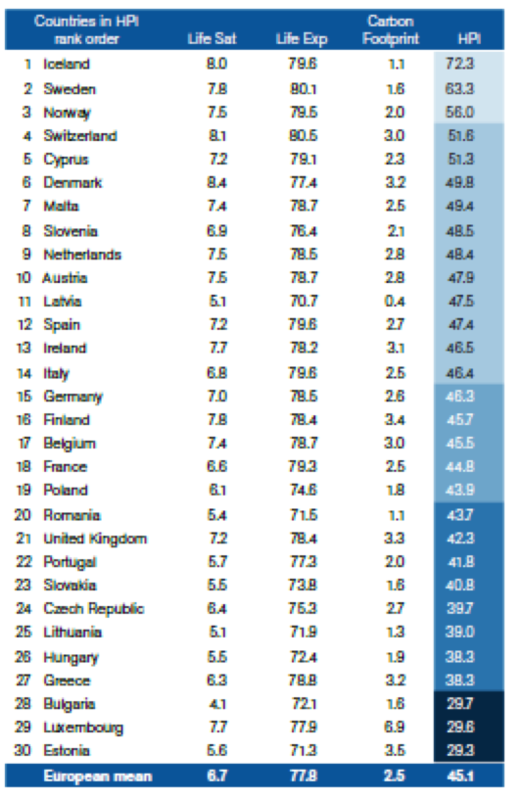 It tells us how well nations are doing in terms of supporting their inhabitants to live good lives. 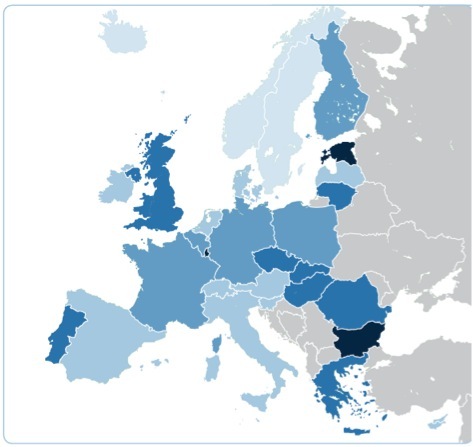 The following graph looks at Europe in relation to HPI; light blue represents countries that have scored high and dark blue represents those that have scored low. Moreover, we need to get western companies to sign up to the Bangladesh Fire and Building Safety Agreement. The International Labour Rights Forum has been requesting apparel companies sourcing from Bangladesh to sign this with mixed success. Some companies signed up while others have decided not to. The programme includes detailed factory inspections by trained, independent safety experts, transparent public reporting, an independent review of Bangladeshi fire and building safety regulations, and a central and on-going role for workers and unions in identifying factory risks and training workers. Surcharges could also be levied on garments which are passed on to the consumer. This is to place a relatively small surcharge to the items: for example, if a t-shirt is priced at £5 then 10 pence can be added on to make it £5.10. Additionally, we need to put pressure on the leadership in developing countries. Sohel Rana was only able to do what he did due to his contacts in the ruling party. We need to put pressure on governments to deal with corruption, to create appropriate legislation and ensure compliance with it, and to have good practices including an interest in the welfare of employees. Mahbub Anam is of Bangladeshi descent and has worked in the field of Human Resources (HR). He completed a Masters in HR as well as the CIPD (Chartered Institute of Personnel Development). He was previously approached to take up a senior HR role in a Bangladeshi garments company which supplies a number of well-known western brands.